[prMac.com] Indianapolis, Indiana - NOTES17 LLC today is proud to announce the release of Pagico for Desktop 6.8, a minor update that brings a number of important improvements that will further enhance the user experience and productivity. This update is free and recommended for all version 6 users. In Pagico for Desktop 6.8, the most important enhancement is the easier-than-ever ability to attach files and emails to new tasks and notes. Users can add files or emails to new tasks via a simple drag-and-drop. In addition, the task description fields are greatly enhanced to make the note-taking process much more enjoyable. Pagico for Desktop is an innovative information manager that manages all types of data, including notes, lists, files, projects and clients. On top of the project & contact management features, Pagico also has a powerful set of scheduling features, assisting users to keep track of their tasks and appointments among projects and clients. Compared to other organizer apps on the market, Pagico's biggest strengths are its ability to manage all types of data by projects & contacts, and its intuitive visualization of users' schedule through its interactive flowchart feature. Pagico for Desktop is a powerful information manager with built-in task management features. Compared to other organizer apps on the market, Pagico's biggest strengths are its ability to manage all types of data by projects & contacts, and its intuitive visualization of users' schedule through its interactive flowchart feature. With the 6.8 update, Pagico can help users further streamline their workflow and make it easier than ever to be and stay organized. "There are two directions when comes to productivity apps. There are todo apps with simple features, and there are complex project management software that comes with a steep learning curve. Pagico is both - it's designed to be powerful, versatile and user-friendly at the same time," comments Lesley Liu, founder of NOTES17, "and with the release of version 6.8, being and staying organized is easier than ever. 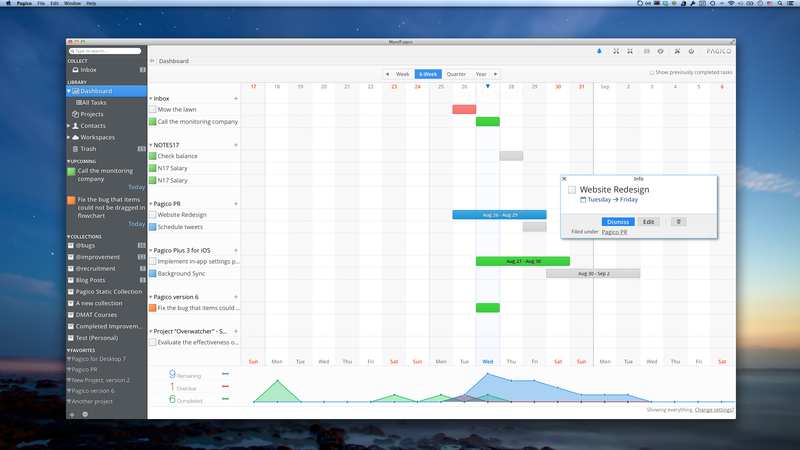 It will be one of the best-looking and easiest-to-use organizer app for Mac." Mac360, a popular Mac app review website, remarked that Pagico is like MS Project but it's much easier to use and comes with a much cheaper price tag. Pagico for Desktop is compatible with Intel-based Macs with OS X 10.5 or later, and Windows PCs running Windows XP or later. The software package can be downloaded from Pagico online with 15-day free trial option available. Pagico for Desktop 6.8 has a regular price of $50 (USD). And it's currently 40%-Off thanks to the Back-to-School promotion (offer ends on September 15). Based in Indianapolis, NOTES17 LLC is an independent software company that develops applications for Mac, Windows, iOS and Android platforms that enhance productivity and user experience with innovative designs. Its current products include the productivity suite Pagico, presentation app Presentics for iPad, and server monitoring app SiteTrac for iPhone. All Material and Software (C) 2014 / NOTES17 LLC. All Rights Reserved. Apple, the Apple logo, Mac OS X, iPhone, iPod, iPad and Macintosh are registered trademarks of Apple Inc. in the U.S. and/or other countries. Other trademarks and registered trademarks may be the property of their respective owners.